I share here a link to an article we published in the CONNECTING NATURE website, titled “Transforming cities and enhancing wellbeing through nature-based solutions: the experience of A Coruña” and authored by the Head of the Environmental Department of the Council of a Coruña, María García, and myself, as a researcher at the People-Environment Research-Group of the University of A Coruña. From May 16-18, 2018, the City of A Coruña, the People-Environment Research-Group organized the International Symposium so-called “Horizon 2020 European Dialogue and Clustering Action: Transforming cities, enhancing wellbeing: innovating with nature-based solutions”, which gathered 200 experts on nature-based solutions. The event was organized in collaboration with the Council of A Coruña and this post summarizes the main inputs and points of discussion resulting from the knowledge-sharing opportunities among EU officers, researchers and cities, with many policy-makers and urban planners involved in the more than 50 presentations organized in this three-day event. A Coruña City Council presented the city’s Green Infrastructure Strategy as well as examples of the different nature-based solutions in the city during the event. The Green Infrastructure Strategy involves the creation of a Network of Natural Spaces of local Interest – such as the islands of San Pedro and the Tower of Hércules – as well the environmental restoration of two river areas for leisure. Besides, the restoration of green spaces for leisure is a major objective for our city in order to overcome the “nature deficit syndrome” in a city with a high population density and insufficient natural spaces. As an example, the Council plans to increase the extension of green areas by planting a total of 1500 trees a year and creating three new urban gardens. As partners of the Connecting Nature project, we would like to learn more about how nature-based solutions can help us to design our city in the future. We are eager to increase our knowledge on the best methods to measure the different kinds of impacts that green spaces might have for the people and the environment. This was a matter of discussion in the cities-summit session on benefits and challenges of green infrastructures for leisure that we led during the Transforming Cities, together with Agnieszka Dziubała (City of Poznań) and Ángela Castrechini (University of Barcelona). Participants also had some time for leisure while learning about the nature-based solutions implemented in our city. 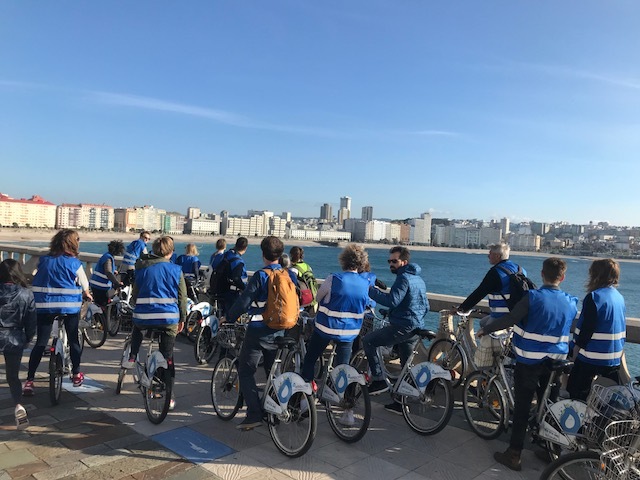 As example, more than one-hundred attendees which joined the excursions to three different nature-based solutions: the Natural Area of the Park of the Tower of Hercules, the Eirís Park Area or cycling along the beautiful A Coruña’s seaside promenade. Transforming Cities was an exceptional opportunity for cities, researchers and green enterprises to engage in enriching discussions about the main contributions of nature-based solutions for sustainable urbanization, fostering low-impact, liveable and resilient cities in Europe and worldwide.